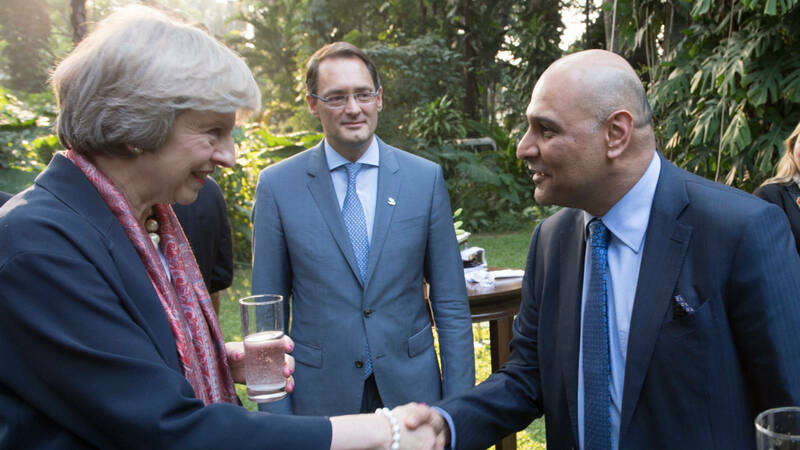 The Prime Minister, Theresa May, invited Dr Nik Kotecha OBE to join her on her first trade mission to India. Dr Kotecha, Chief Executive of Morningside Pharmaceuticals Ltd, was among 30 captains of industry on the three day visit to Delhi and Mumbai, in order to drum up business and help negotiate a post-Brexit trade agreement. Following the trip £1.2 billion in trade deals were announced. This was the Prime Minister’s first trade mission, with a business delegation drawn from regions across the UK accompanying her to India. The Secretary of State for International Trade, Liam Fox, and the Trade Minister Greg Hands also joined the visit. The Prime Minister went to India to deliver on her ambitious vision for Britain after Brexit, forging a new global role for the UK beyond the continent of Europe. She also delivered on her pledge for an economy that works for all, by introducing new and emerging enterprises, as well as more established players, to the key Indian market. A number of commercial deals were signed during the visit, creating and securing jobs at home and demonstrating market confidence in the strength of the British economy. The Prime Minister met with Prime Minister Modi to discuss developing the strategic partnership between the UK and India, building on the deep links and co-operation we already share. Alongside Prime Minister Modi, the Prime Minister inaugurated the India-UK TECH Summit, South Asia’s largest technology conference. The Indian diaspora plays a vital role in our national life with approximately 1.5 million people of Indian origin in the UK and Indian companies currently employing over 100,000 people in the UK. India is now our second largest international job creator, with 7,105 new jobs in Britain in the past year.